Dimensions: 5ft. 8in. x 5ft. 6in. 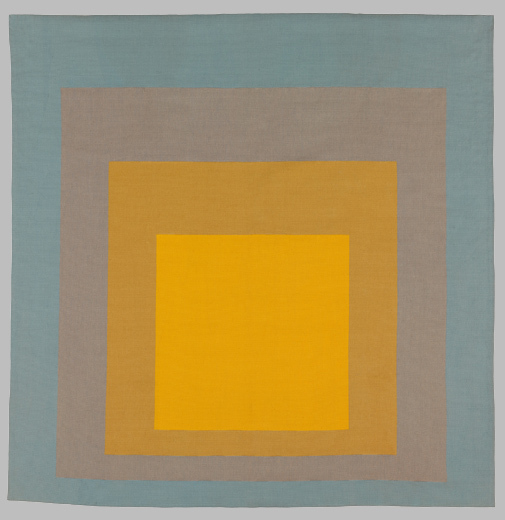 After leaving his teaching position at Black Mountain College in 1950, Joseph Albers was hired to expand and develop the Yale department of design. There he began his Hommage to the Square, a pursuit that would last 25 years and grow to a body of work composed of thousands of paintings, prints, drawings and tapestries. The entire series was based on a mathematically determined format of usually four superimposed squares. This abstraction was the template Albers used to explore the effect adjacent colors have on one another and the illusion of planes of color advancing or receding in space.